Request a quote for a bulk order for H3K27me3S28p polyclonal antibody - Classic. Please fill out the form here below. Your local sales account manager will get in touch with you shortly and send you a quotation based on your requirements. 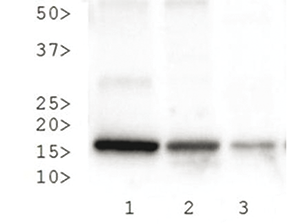 Polyclonal antibody raised in rabbit against Histone H3 (trimethyl Lys27, p Ser28), using a KLH-conjugated synthetic peptide. 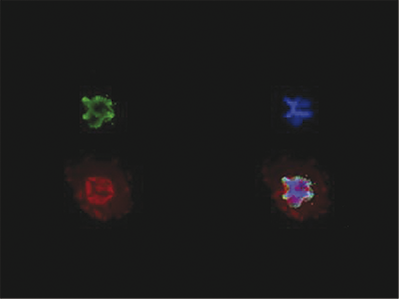 Chromatin Immunoprecipitation using the H3K27me3S28p antibody. Chromatin from one million formaldehyde cross-linked HeLa cells was used with 2 μg of H3K27me3S28p and 20 μl of magnetic IgG beads per immunoprecipitation. A no antibody (No Ab) control was also used. Immunoprecipitated DNA was quantified using quantitative PCR and normalized to the input chromatin. 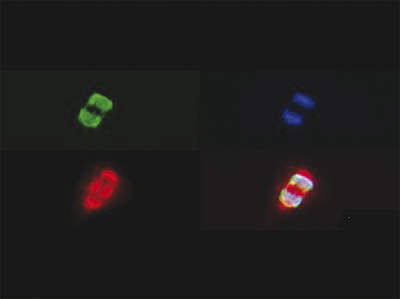 Immunofluorescence of H3K27me3S28p antibody. Tissue: HeLa cells. Fixation: 0.5% PFA. Primary antibody used at a 1:200 dilution for 1 h at RT. Secondary antibody: Dylight 488 secondary antibody at 1:10,000 for 45 min at RT. 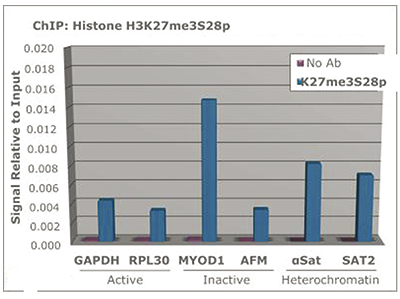 Localization: Histone H3K27me3S28p is nuclear and chromosomal. Staining: Histone H3K27me3S28p is expressed in green, nuclei and alpha-tubulin are counterstained with DAPI (blue) and Dylight 550 (red). Western Blot of H3K27me3S28p antibody. Lane 1: HeLa histone extracts. Lane 2: NIH-3T3 histone extracts. Lane 3: C. elegans embryo cell lysate. Load: 30 μg per lane. 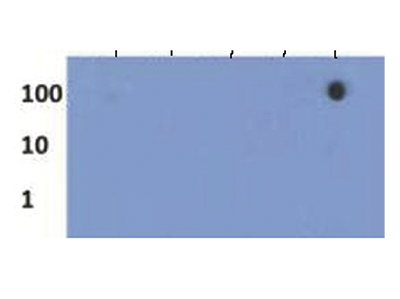 Primary antibody used at 1 μg/ml overnight at 4°C. Secondary antibody: IRDye800TM rabbit secondary antibody at 1:10,000 for 45 min at RT. Predicted/ Observed size: ~15 kDa. Other band(s): None. Dot Blot of H3K27me3S28p antibody. Lane 1: S28p/K27 unmodified. Lane 2: S28p N-Term. Lane 3: S28p C-term. Lane 4: K27Me3. Lane 5: S28p/K27Me3. Load: 1, 10, and 100 picomoles of peptide. Primary antibody at 1 μg/ml for 45 min at 4°C. Secondary antibody: DylightTM488 rabbit secondary antibody at 1:10,000 for 45 min at RT. Diagenode strongly recommends using this:	H3K27me3S28p polyclonal antibody - Classic (Diagenode Cat# C15410293 Lot# 001). Click here to copy to clipboard.